It’s a Bird! It’s a Spin! It’s the mobility craze taking over America. And now, you can find every cute lil scoot with our app, Transit. Cuter than a bus. Cheaper than a taxi. Nimbler than a bicycle. That’s the sales pitch for the newest app-powered vehicles to hit the streets: electric scooters. No, we’re not joking. Startups are strapping motors onto your favourite childhood ankle-bruising mode of transport, adding some GPSes, then loading them onto the sidewalks. You can find them in San Francisco, Los Angeles, Washington DC… and a bunch of other cities. And now they’re in our app Transit, too. We’ve aggregated e-scooters from Bird, Spin, Waybots and (in a limited capacity) LimeBike. They join all the other services we help you locate, track, and plan trips for: dockless bikeshare, docked bikeshare, carshare, rideshare, and public transit. Now instead of triple-checking between each scooter app, we’ll help you find the closest scooter (regardless of operator) and plan a trip with it. Best of all, it takes five seconds. Once you find a scooter, we’ll deep-link you to the corresponding app, so you can unlock it. Easy peasy. Scooters offer a fun, lightweight alternative for short (< 3km) trips, and help you complete all those pesky first- and last-mile legs. A new good reason not to own a car. Despite our enthusiasm for our spiffy new L-shaped friends, the scooters aren’t without their detractors. Since they don’t require you to dock them at a station, like a traditional bikeshare (or lock them to a post, like JUMP) people can leave them where they want. 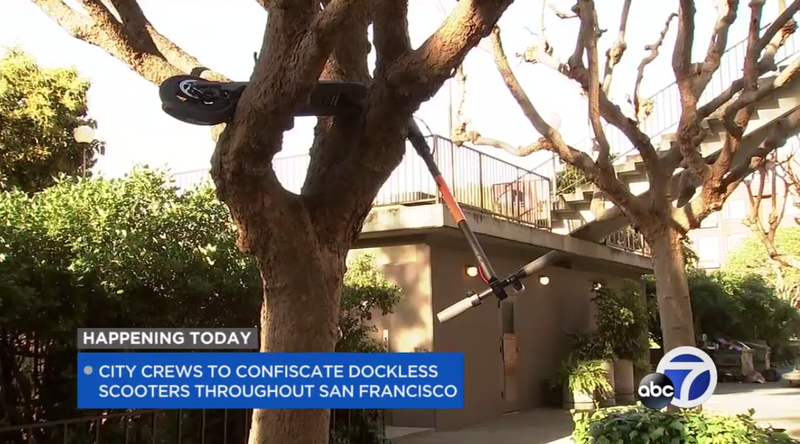 While all the scooter companies ask riders to park them responsibly (near a bike rack, leaned on a wall, and definitely not in the middle of a sidewalk), scooters are occasionally left in less-than-desirable places, where you’re forced to step over them or — when parked up a tree — duck your head. This has prompted some NIMBYs to ask for the scooters to be taken away. Take that last (non-ironic) tweet, from Katy Tang. She disregards the GIANT CAR obstructing the crosswalk, and only focuses on the scooter abandoned on the street. If only people saw cars the way NIMBYs see scooters! Dockless e-scooters offer an innovative way of connecting people with public transit (and, ultimately, getting cars off the road.) At ~$2–3 per ride, they’re cheaper than a $10 taxi or rideshare to the train station, and are often straight-up faster. You don’t need to wait for your driver to finish their current run — you can find one nearby and speed off immediately. And you can park them right at your bus stop or station, which you often can’t do with cars. With millions of electric-assist trips in a few short months — and in combination with other modes and public transit — cities are already becoming less dependent on cars. Just look at early “mobility tech” markets like San Francisco, where car registrations are falling for the first time in modern history. Thankfully, there’s reason to believe that “parking problems” are just awkward growing pains. 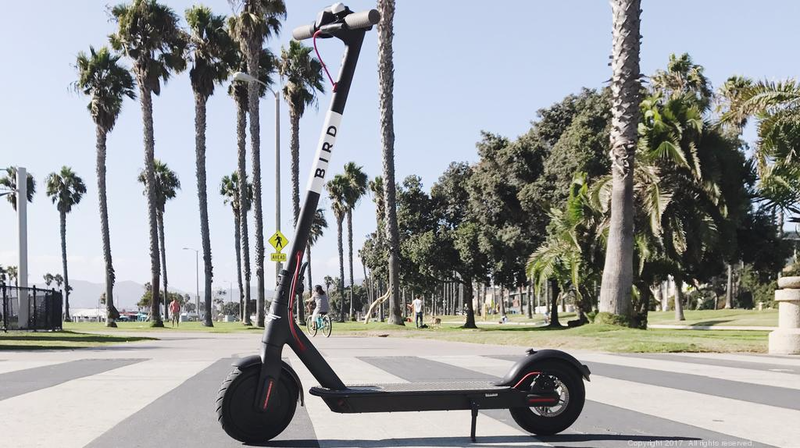 Bird and LimeBike now require riders to submit a post-ride “proof of good parking” photo. The city is also adding regulations to make sure these zippity scootbois aren’t mixing with pedestrian traffic on sidewalks. We expect the other companies to follow suit, for cities to bolster their efforts, and for rogue riders to park (and ride) with a bit more common sense. We’re thrilled to be the first company to aggregate dockless e-scooters (and bikes). 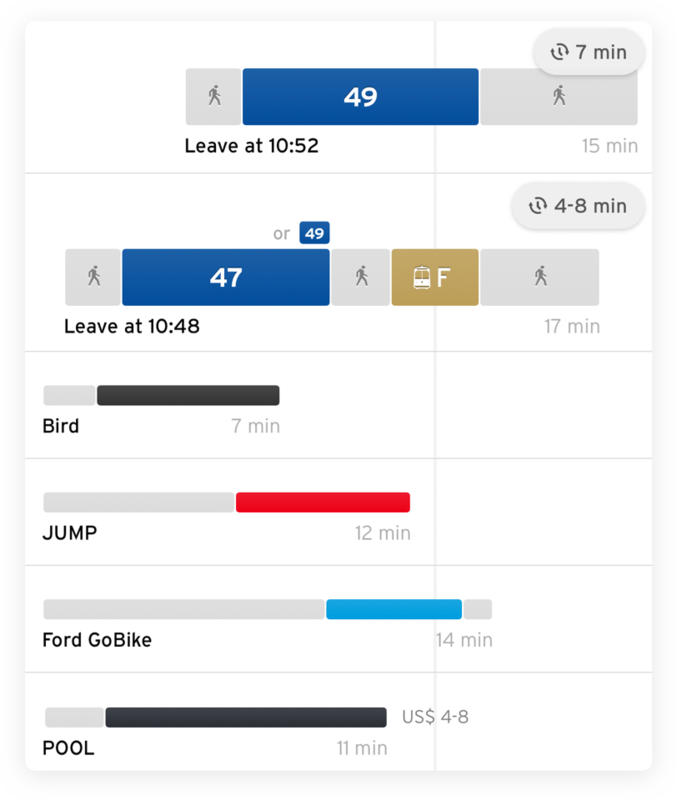 As the only app that lets you locate, compare, and plan trips across different operators and services, we can’t wait to see the response from our multimodal maniacs. As for the millions of our users who have never taken an electric scooter before? They’re about to find out just how fun they can be.